What is a Clean Out? 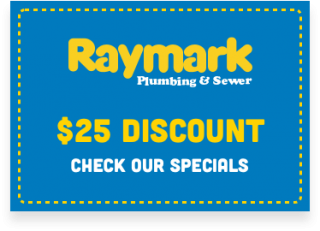 When you call Raymark Plumbing and Sewer about a backup or clog in the lower level of your home, one of our Customer Service Representatives may ask you if you have a clean out. A clean out is an opening into the main drain line of your home. Its sole purpose is to provide access to the drain line or side sewer so that a technician can open and clear the line. Without a clean out, the line needs to be cut in order to clear a clog. To clarify, the clean out is a piece of pipe with a cap and it must be water tight and gas tight. The cap usually has a raised square head that opens with a special wrench. The pipe may be a Y-shaped fitting that branches out from the main line. It may be made of cast iron in older homes and plastic in newer homes. Its location is usually in the basement, near a floor drain, or in a utility room. If outside, it is installed at ground level, poking its cap out from where it is connected to the home’s main drain line underground. A clean out can also be installed under a cover plate. However, not all clogs require using the clean out; it depends on where the clog is located. For example, a clogged kitchen or bathroom sink can usually be fixed by clearing the p-trap under the sink. And a toilet clog can usually be cleared with a plunger or a small snake. But clogs and backups that are located in the lower level of your house and that impact multiple fixtures in your home, may indicate a larger clog problem down the line. In these cases, the technician removes the clean out cap and inserts a snake to clear any blockages. New plumbing code requires the installation of a clean out, and the size of the clean out is dependent on the size of the pipe. If you don’t have a clean out, we can install one for you. 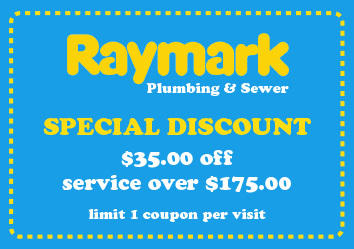 Call Raymark Plumbing and Sewer for all of your plumbing and sewer needs. We are experts in installing clean outs and clearing drain and sewer lines.